I woke up this morning to find our chicken coop run covered in white feathers and Sarah no where to be seen. This is always disturbing because it looks like a chicken crime scene. I knew there was a reasonable explanation, that she was probably up in the coop working on today's egg delivery, but you have to wonder what's going on with the feathers. I suspect she's hotter than the chicken we roasted in the oven last night due to the change in temperatures around here. It's been uncommonly warm (or so it seems) with fifty degree temperatures during the day. The other night it was still 50 degrees at midnight. Compared to the build up of feathers for the more frigid weather, she probably just needed to blow a few feathers to stay comfortable. For you chicken keepers, do you see this as well when the weather gets a little warmer? Could she be having an unseasonal molt? One of our girls decided the coldest few weeks in UK in decades would be the best time for her first moult. The silly. It panicked me when she first started dropping her feathers - I could see where she'd been stood because of the little circles of feathers. She's refeathering now but is still minus all her long tail feathers - she's got such a round bum compared to the others at the moment! One or two of ours will sometimes molt unseasonably. There might be a small increase in the number of feathers around during the spring but I'm not sure. Normally though, when I open the coop door and a huge puff of feathers comes out it's b/c someone did their molt all at once and now they're naked. Which looks hilarious :-) And then they go through that brief porcupine stage when their feathers come in but just before they unfurl. My chickens crack me up! 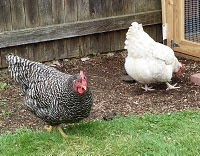 Like you, we are a new backyard chicken family. We also live in the same general area and have raccoons in the neighborhood. Except for fresh bedding, we didn't do anything special for the colder days. Our coop design is different so no Plexiglas wind breakers (yet). Our three Rhode Island Reds seem to be handling the weather change without problems - no loss of feathers or dramatic change of activity.